Did you know that, when it came time to cast the original 1978 'Superman,' the producers looked at a long list of almost every single young star in Hollywood? The shortlist included Muhammad Ali, Al Pacino, James Caan, Steve McQueen, Clint Eastwood, Robert Redford, Jon Voight, Warren Beatty, Burt Reynolds, Christopher Walken, Nick Nolte, Dustin Hoffman (who would also later turn down the role of Lex Luthor) and Paul Newman (who turned down Superman, Lex Luthor and Jor-El…geez, Paul, tell us how you really feel!). The reasons why different actors didn’t step into those blue and red tights are varied - Redford wanted too much money, Eastwood was too busy, Caan said there was "no way" he would get into the "silly suit" and Nolte wanted Superman to be schizophrenic (um…okay?). Meanwhile, Hollywood newbies like Sylvester Stallone and Arnold Schwarzenegger were dying to play the role, but both were shot down by Marlon Brando, who had a hand in casting, and, it was rumored, was highly threatened by the idea of either of these two hard-bodied testosterone-y hunks eclipsing his masculine star power. Eventually, a young unknown dreamboat named Christopher Reeve was cast and the rest is Hollywood history! 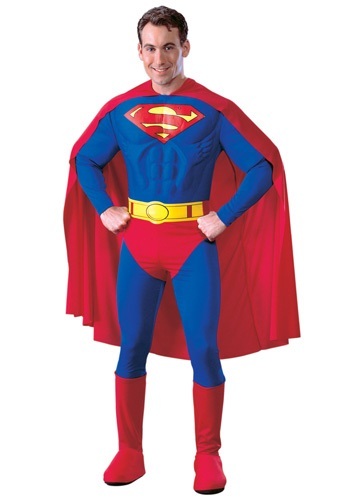 So this Halloween, step into this comic book and movie legend's underpants one leg at a time with this Adult Superman Movie Costume! Modeled after the original Superman movie's costume, it even features foam padding in the suit to save you time on all that pesky body building (another fun fact: Christoper Reeve gained nearly 50 pounds of muscle for the film! That's a lotta meat!). Up up and away!